— John Julius Norwich, ed. 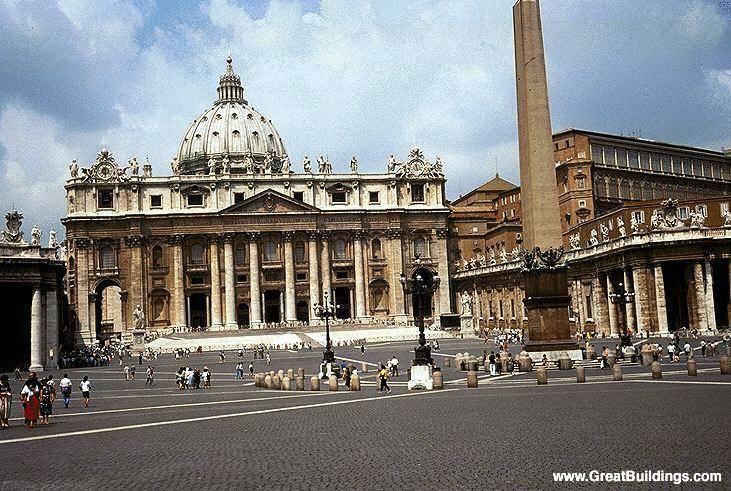 Great Architecture of the World. p153. — John Julius Norwich, ed. The World Atlas of Architecture. p276. — taken from John Julius Norwich, ed. Great Architecture of the World. p153. 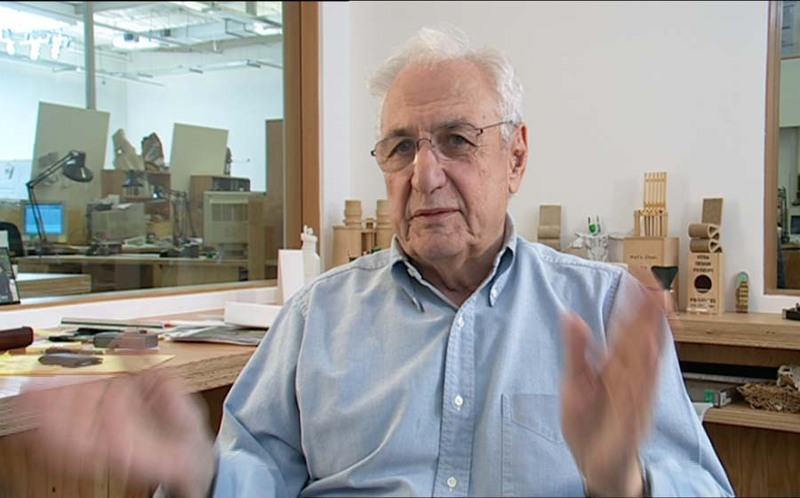 Frank Gehry was born in Toronto, Ontario, Canada in 1929. He studied at the Universities of Southern California and Harvard, before he established his first practice, Frank O. Gehry and Associates in 1963. In 1979 this practice was succeeded by the firm Gehry & Krueger Inc.
Over the years, Gehry has moved away from a conventional commercial practice to a artistically directed atelier. His deconstructed architectural style began to emerge in the late 1970s when Gehry, directed by a personal vision of architecture, created collage-like compositions out of found materials. Instead of creating buildings, Gehry creates ad-hoc pieces of functional sculpture. Gehry’s architecture has undergone a marked evolution from the plywood and corrugated-metal vernacular of his early works to the distorted but pristine concrete of his later works. However, the works retain a deconstructed aesthetic that fits well with the increasingly disjointed culture to which they belong. 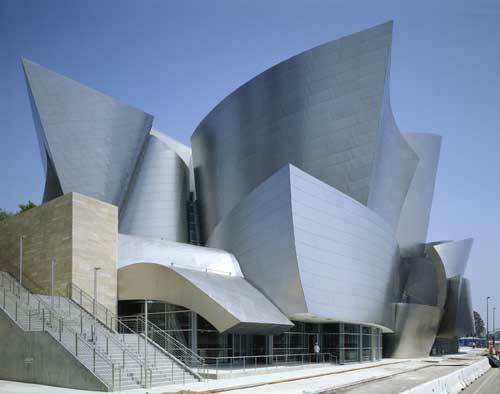 In the large-scale public commissions he has received since he converted to a deconstructive aesthetic, Gehry has explored the classical architecture themes. In these works he melds formal compositions with an exploded aesthetic. Most recently, Gehry has combined sensous curving forms with complex deconstructive massing, achieving significant new results. American Center, at Paris, France, 1988. California Aerospace Museum, at Los Angeles, CA, 1982 to 1984. Edgemar Development, at Santa Monica, CA, 1984. Experience Music Project, at Seattle, Washington, 1999 to 2000. Fishdance Restaurant, at Kobe, Japan, 1986 to 1989. Gehry House, at Santa Monica, California, 1979 and 1987. Goldwyn Branch Library, at Hollywood, CA, 1982. Guggenheim Museum Bilbao, at Bilbao, Spain, 1997. Herman Miller Facilities, at Rocklin, CA, 1985. Hollywood Bowl, at Hollywood, CA, 1970 to 1982. Joseph Magnin Store, at Costa Mesa, CA, 1968. Loyola University Law School, at Los Angeles, CA, 1981 to 1984. Los Angeles Children’s Museum, at Los Angeles, CA, 1979. Norton House, at Venice, CA, 1983. O’Neill Hay Barn, at San Juan Capistrano, CA, 1968. Ron Davis Studio and House, at Malibu, CA, 1970 to 1972. Rouse Company Headquarters, at Columbia, MD, 1974. Ruscha House, at 29 Palms, CA, 1977. Santa Monica Place, at Santa Monica, CA, 1973 to 1980. Schnabel Residence, at Brentwood, CA, 1986. University of Minnesota Art Museum, at Minneapolis, MN, 1990. Venice Beach House, at Venice, CA, 1986. Vitra Design Museum, at Weil-am-Rhein, Germany, 1987 to 1989. Winton Guest House, at Wayzata, Minnesota, 1984 to 1986. Wosk Residence, at Beverly Hills, CA, 1982. Yale Psychiatric Institute, at New Haven, CT, 1985 to 1989. Venice Beach House, Venice, California. Harry Mohr Weese (June 30, 1915 – October 29, 1998) was an American architect, who was born in Evanston, Illinois in the Chicago suburbs who had an important role in 20th century modernism and historic preservation. His brother, Ben Weese, is also a renowned architect. Weese also served as a judge for the Vietnam Veterans Memorial design competition. The Humanities Building at the University of Wisconsin–Madison, widely considered one the Midwest’s best examples of brutalist architecture but slated for demolition soon. William J. Campbell United States Courthouse Annex in downtown Chicago (formerly known as the Metropolitan Correctional Center, Chicago.) Federal temporary holding prison which has no window bars, instead each cell is provided with a vertical 5″ slot window. Weese was mandated to follow then new federal prison architectural guidelines, like cells having no bars and by original design each prisoner had his own room. G-Series: Office administration documents for securing goods an services and administring and closing out project agreements. The Reliance Building is the first skyscraper to have large plate glass windows make up the majority of its surface area, foreshadowing a feature of skyscrapers that would become dominant in the 20th century. It is located at 32 North State Street, Chicago, Illinois, and as of 2006 houses the Hotel Burnham. The Reliance building was listed on the National Register of Historic Places in 1970; and on January 7, 1976, it was designated a National Historic Landmark in the USA. The world’s first metal-framed, glass curtain-walled building was Oriel Chambers, 1864, Liverpool, England. The building was only five floors high, as the elevator had not been invented. The building is the precursor of modern buildings. One of the architects of the Reliance Building, John Root, was a student in Liverpool during the construction of Oriel Chambers and 16 Cook Street, Liverpool, the second such building. 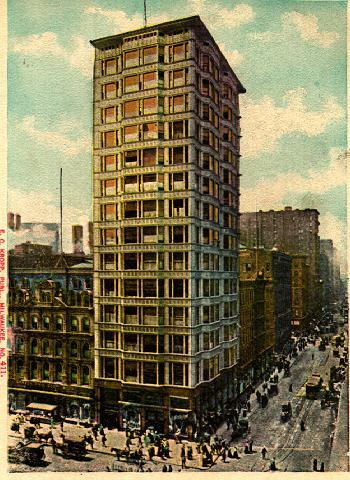 The Reliance Building resembles Oriel Chambers in the construction method and use of oriel windows. Notes Modular construction system – prefabricated iron sections. Floor area of 770,000 sq ft.,1851 ft long, 450 ft wide. The Crystal Palace was a cast-iron and glass building originally erected in Hyde Park, London, England, to house the Great Exhibition of 1851. More than 14,000 exhibitors from around the world gathered in the Palace’s 990,000 square feet (92,000 m2) of exhibition space to display examples of the latest technology developed in the Industrial Revolution. Designed by Joseph Paxton, the Great Exhibition building was 1,851 feet (564 m) long, with an interior height of 108 feet (33 m). After the exhibition, the building was moved to a new park in a high, healthy and affluent area of London called Sydenham Hill, an area not much changed today from the well-heeled suburb full of large villas that it was during its Victorian heyday. The Crystal Palace was enlarged and stood in the area from 1854 to 1936, when it was destroyed by fire. It attracted many thousands of visitors from all levels of society. The name Crystal Palace (the satirical magazine Punch usually gets the credit for coining the phrase) was later used to denote this area of south London and the park that surrounds the site, home of the Crystal Palace National Sports Centre. 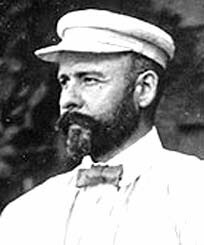 Louis Sullivan was born in Boston, Massachusetts in 1856. He studied architecture at the Massachusetts Institute of Technology for one year. He then worked as a draughtsman for Furness and Hewitt in Philadelphia and for William Le Baron Jenney in Chicago. In July 1874 Sullivan travelled to Europe where he studied in the Vaudremer studio at the Ecole des Beaux Arts in Paris. He returned to Chicago a year later. In 1883 Sullivan became a full partner with Dankmar Adler. They remained together until 1895 when Adler retired. Although Sullivan was usually viewed as the designer being backed by Adler’s engineering skills, Adler’s work showed an individual strength that has often been ignored. A notable designer who moved up within the office, eventually going out on his own, was Frank Lloyd Wright. Sullivan’s designs generally involved a simple geometric form decorated with ornamentation based on organic symbolism. 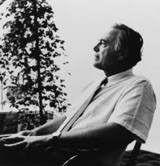 As an organizer and formal theorist on aesthetics, he propounded an architecture that exhibited the spirit of the time and needs of the people. Considered one of the most influential forces in the Chicago School, his philosophy that form should always follow function went beyond functional and structural expressions. Considered the “Dean of American Architects”, Sullivan died in Chicago, Illinois 1924 shortly after The Autobiography of an Idea and A System of Architectural Ornament. were published.